Since we had no submissions in the category Best media/video documenting a heritage site (national) prize it was decided to award this prize in the form of a third prize place instead. The award ceremony will take place at 6pm on Saturday the 28th November 2015 at TwentyFifty, 2nd Floor, 8 Spin Street, Cape Town. Congratulations to our winners! 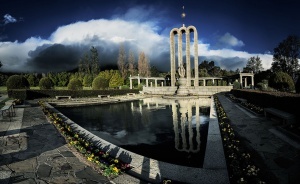 This year 424 photographs were submitted to Wiki Loves Monuments South Africa by 40 participants. We would like to thank each of the participants that submitted photographs in the 2015 competition. Although this is the last Wiki Loves Monuments competition in South Africa for the foreseeable future we are planning to have another Wiki Loves competition focusing on a different topic in 2016. You can view all of the photographs submitted during Wiki Loves Monuments South Africa 2015 on Wikimedia Commons here. You can view all of the photographs submitted globally during 2015 on Wikimedia Commons here. This year a grand total of 242,344 photographs were submitted by 7,498 participants from all over the world totalling 1,287.9 gigabytes of submitted pictures. This is a decrease from last year's 369,589 photographs that were submitted globally in 2013 submitted by 11,943. The number of registered grade I through grade II monuments in South Africa by province. The size of the numbers is loosely relative to the number of registered monuments in each province. Heritage resources with qualities so exceptional that they are of special national significance. There are 18 sites in this category. Heritage resources which, although forming part of the national estate, can be considered to have special qualities which make them significant within the context of a province or a region. There are 3019 sites in this category, of which 1500 sites are unmapped. Other heritage resources worthy of conservation. There are 39,145 sites in this category, all of them unmapped. A list of grade I through to grade II monuments in your province and their respective SAHRA ID can be found here. Below is a list of some suggested monuments for participants to photograph of both listed and unlisted locations. As always participants are encouraged to photograph widely as they like and also consider photographing other listed and unlisted locations. These locations are all listed grade I and II monuments in South Africa. You can see a list of other monuments nearby by clicking on their respective links. Unfortunately a number of the suggested unlisted monuments we had recommended previously might be subject to Freedom of Panorama issues. We have therefore asked that pictures of monuments that were built recently not be submitted. We are sorry for the confusion. The pictures have to be your own work and uploaded by yourself. Only pictures uploaded during the month of September 2015 are eligible. Uploaded photographs do not have to be taken during September 2015. Pictures must not have been uploaded to Wikimedia Commons before. Only pictures released under a free license are eligible to participate. All uploads must show its SAHRA ID number. If they are proposed monuments, use the code "New". You need to have account at Wikimedia Commons. The national juries will nominate photos for the international contest. International awards can be found here. Wikimedia South Africa is a Wikimedia chapter for the Republic of South Africa. It is incorporated as a Section 21 non-profit-making organisation under South African law. It was founded locally on 25 February 2012 after being approved as a chapter by the Wikimedia Foundation on 26 March 2011. This chapter will promote local awareness of the projects and their proper academic use, encourage translation efforts into local languages, support the creation of local free knowledge and media and offer scholarships for promising local students. Please visit our website if you are interested in joining us. Wikimedia South Africa is an independent organisation for Wikimedia volunteers. This page was last modified on 2 November 2015, at 21:52. This page has been accessed 639,072 times.